Here you could enjoy a breakfast with ricotta-filled pastries, Neapolitan pastiera, croissants stuffed with chocolate, cream or jam, but you could also taste other savory homemade delicacies. Ricotta-filled pastries, Neapolitan pastiera, croissants stuffed with chocolate, cream or jam – but not only that; this is just what you can eat for breakfast. If you want, at Barettino you can also find savory delicacies: vegetarian or ragoutlasagne, spaghetti seasoned with pesto, sage and butter mezzelune, focaccia bread with tomatoes, olives and many stuffings, chopped salads, omelets and savoury pies. 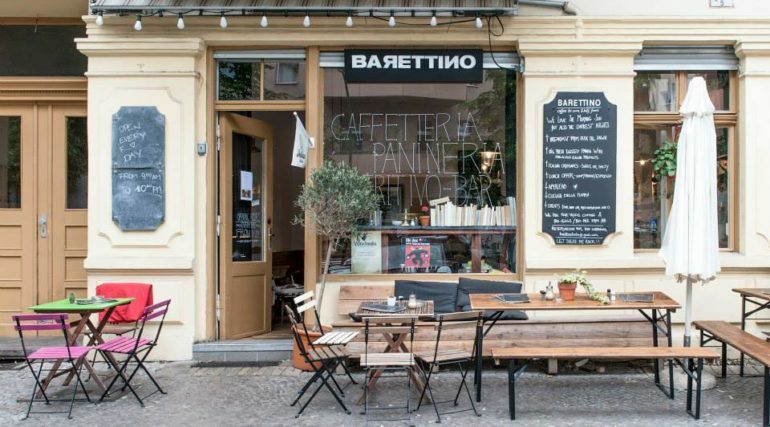 There are two recurring elements in this list: the first one is the place where you can eat them – Barettino, in Neukölln – and the second one is the fact that all these delicacies are homemade, even the fresh pasta, the pesto and many other ingredients that you can never imagine to be realized in a Berliner kitchen. An all-female reality. We are in Reuterstraße, 59. There are Maria and Djamila, the two owners – both of 30 years old. The first one is Italian, from Cattolica, while the second one is German, from Freiburg. They tell us about their adventure as entrepreneurs and they also explain us how important is doing a good grocery shopping. «It is not always simple to have quality products. We use only Italian products, but our spirits are those of two Berliners.» Barettino is furnished with simplicity, even if there are some religious and punk objects, for example a skull near the cashier’s desk or many black and white photos of some punk concerts. When you are here you feel like you are at home – a home with a particular style. «Barettino was opened in 2013, after many years of experience in the food service industry. We wanted to have our own place, a place where we could combine our Italian and German origins and express all that we are. We are different, but our relationship is very special» Maria says with a smile. The first time they met was in 2010 – and they became (almost) immediately friends. «The first time I saw Djamila, I thought she was unpleasant. But the first day of work, we arrived dressed in the same way and we were listening the same song in the headphones. I enjoyed working with her and, from that day, we have always been together» Maria tells us. Going to the bar is almost a religion for Italian people. «It is different from the German “café” – in an Italian bar you can also eat something. We run a Berliner bar, that has an Italian flavour.» Here you can (and must, at least once in your life) have breakfast: cappuccino, espresso, croissants stuffed with jam or chocolate, pastries, cakes – but there is also the German breakfast, with cold cuts and scrambled eggs. At lunch, you can eat one of the many “paninoni” (big sandwiches) – with typical Italian stuffings. But if you want to eat lightly, there are many chopped salads. In Barettino you can also drink excellent wines, spritzes, or eat different kinds of Italian pasta. «Our cuisine is just like mom’s fresh cooking.» Barettino could turn out to be a place against the nostalgia for Italian cuisine. Open Monday to Sunday, from 9 a.m. to 10 p.m.